Murder of Thomas Becket in manuscript BL Harley 5102, England, late 12th-century. 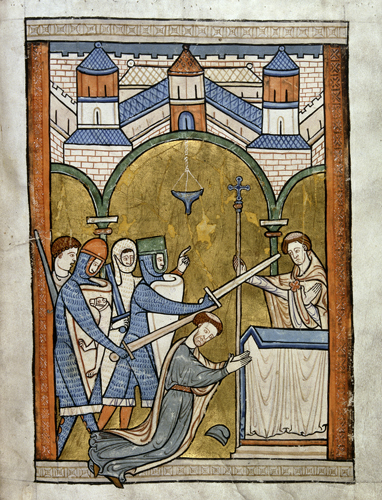 A larger image of the Murder of Thomas Becket in manuscript BL Harley 5102, England, late 12th-century. Decoration: 5 full-page miniatures in colours and gold, on inserted leaves, including the murder of Becket (ff. 17, 32, 68, 118, 129).